When picking fall flowers to use for your garden, there are many options to choose from. Most believe that spring and summer are the two seasons to highlight a colorful flower garden full of sunny blooms. However, there is no comparison to the richness of color that a fall flower garden may offer with its crimsons, yellows, oranges, and even blues. The rewards of a successful fall flower garden are the final prize of splendor for any hardworking gardener. Read on to get five easy fall flower garden ideas. To properly start a fall flower garden, plant your fall flowers in the spring so that your plants may have a sufficient amount of time to grow and flourish for the fall. If you plant your garden in the summer or fall, your blooms will most likely come to late. The first idea for a fall flower is Hostas. Hostas are great for flower gardens because they are available in many sizes and colors. Hostas come in bright yellows and greens, and blue. This flower last through September and October and will add a sense of variety to your garden. The second idea is Fall Mums. Fall Mums are considered to be one of the most popular fall flowers because of their fluffy blooms and they are very easy to maintain. Fall Mums come a wide variety of colors from gold and rust to pink and white. Be careful not to over-water mums and only water them when they appear thirsty or dry every 2-3 days. The third fall flower idea is the sunflower. Most gardeners are familiar with the big, traditional sunflowers, but it is the perennial sunflowers that give gardens true beauty. One example of a perennial sunflower is the ‘Lemon Queen.’ It produces yellow blooms in the late summer and autumn months. 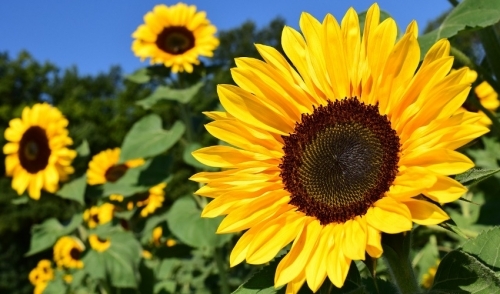 Sunflowers are available in multiple shades of yellow and various shades of red and burgundy. The fourth idea is the Autumn Clematis. Clematis' are great to add to the back of your fall flower garden because they grow fast, tall, and can be an aggressive vine plant. Autumn Clematis can grow up to 20 feet tall and offer one of the season’s best and sweetest scents. It clothes itself with white blooms at the end of the season. Finally any fall garden cannot be completed without chrysanthemums. Chrysanthemums are great because come in array of flower head types such as spoon, pompom, single, reflexed, intermediate, and incurved. They produce great autumn colors that can enhance the appearance of any fall flower garden. There are more than five ideas for fall flowers but these were described just to get your creative juices flowing. You can arrange and build your fall flower garden any way you want. Always remember to use different texture and a variety of colors to make your flower garden as beautiful as possible.